The most luxurious mobile home in the world. The top-of-the-line model offers unbeatable technical innovations and comfort features. Entry level in the high-end class of mobile living. First-class seating and an ambient space for up to eight passengers. Business lounge, mobile office or conference center. Your individual customized business jet on wheels. The prestigious design truck is suited to haul any standard trailer and provides undivided attention. 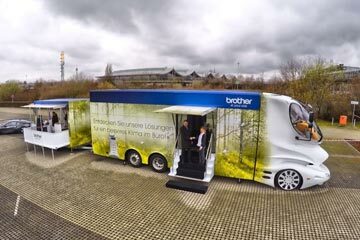 Brother, the printer, multifunctional and fax machine manufacturer, launched its annual tour at the start of 2016 in an eleMMent Visione. 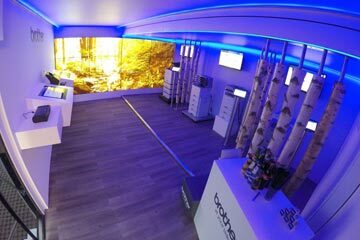 This mobile showroom is as individual as the brand itself: In keeping with the tour motto “Towards a better office climate“, a forest atmosphere was created inside of the twelve meter long high-end vehicle. 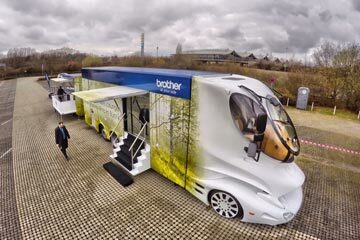 State-of-the-art multimedia components combined with natural materials provide the perfect platform for Brother dealers and customers. The tour demonstrates that “Green” is not just a winning choice in the interior where the environmentally-friendly products are presented. The particularly aerodynamic design of the “eleMMent Visione” also achieves considerable fuel savings. Participation in the “Marchi GoGreen” program fully compensates for the remaining emissions. This is also communicated by the striking “Go-Green” logo on the vehicle. The eleMMent Visione: a functional design that effectively communicates your brand.